It was a rough fourth quarter for many hedge funds, which were naturally unable to overcome the big dip in the broad market, as the S&P 500 fell by about 4.8% during 2018 and average hedge fund losing about 1%. The Russell 2000, composed of smaller companies, performed even worse, trailing the S&P by more than 6 percentage points, as investors fled less-known quantities for safe havens. This was the case with hedge funds, who we heard were pulling money from the market amid the volatility, which included money from small-cap stocks, which they invest in at a higher rate than other investors. This action contributed to the greater decline in these stocks during the tumultuous period. We will study how this market volatility affected their sentiment towards Reinsurance Group of America Inc (NYSE:RGA) during the quarter below. Reinsurance Group of America Inc (NYSE:RGA) was in 27 hedge funds’ portfolios at the end of the fourth quarter of 2018. RGA investors should be aware of an increase in support from the world’s most elite money managers lately. There were 21 hedge funds in our database with RGA positions at the end of the previous quarter. Our calculations also showed that RGA isn’t among the 30 most popular stocks among hedge funds. Let’s go over the recent hedge fund action surrounding Reinsurance Group of America Inc (NYSE:RGA). At the end of the fourth quarter, a total of 27 of the hedge funds tracked by Insider Monkey held long positions in this stock, a change of 29% from the previous quarter. 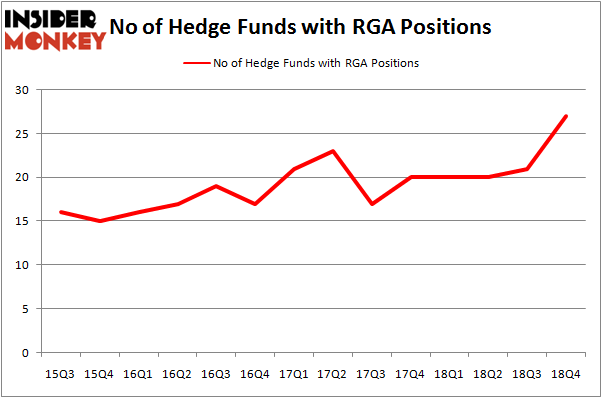 On the other hand, there were a total of 20 hedge funds with a bullish position in RGA a year ago. With hedgies’ sentiment swirling, there exists a few key hedge fund managers who were boosting their stakes meaningfully (or already accumulated large positions). More specifically, AQR Capital Management was the largest shareholder of Reinsurance Group of America Inc (NYSE:RGA), with a stake worth $216.9 million reported as of the end of September. Trailing AQR Capital Management was Citadel Investment Group, which amassed a stake valued at $91.5 million. Diamond Hill Capital, Polar Capital, and Balyasny Asset Management were also very fond of the stock, giving the stock large weights in their portfolios. With a general bullishness amongst the heavyweights, specific money managers have been driving this bullishness. Prana Capital Management, managed by Peter Seuss, established the most valuable position in Reinsurance Group of America Inc (NYSE:RGA). Prana Capital Management had $5.4 million invested in the company at the end of the quarter. 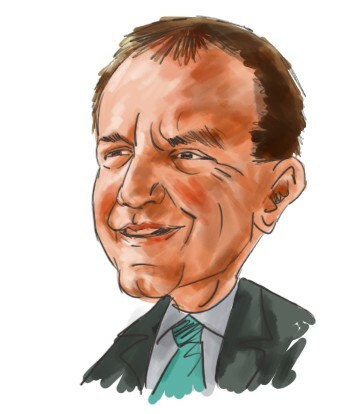 Paul Tudor Jones’s Tudor Investment Corp also made a $1.2 million investment in the stock during the quarter. The following funds were also among the new RGA investors: Hoon Kim’s Quantinno Capital, Jim Simons’s Renaissance Technologies, and David Andre and Astro Teller’s Cerebellum Capital. Let’s also examine hedge fund activity in other stocks – not necessarily in the same industry as Reinsurance Group of America Inc (NYSE:RGA) but similarly valued. These stocks are Shaw Communications Inc (NYSE:SJR), AXA Equitable Holdings, Inc. (NYSE:EQH), Sun Communities Inc (NYSE:SUI), and Qurate Retail, Inc. (NASDAQ:QRTEA). This group of stocks’ market caps match RGA’s market cap. As you can see these stocks had an average of 24.25 hedge funds with bullish positions and the average amount invested in these stocks was $583 million. That figure was $566 million in RGA’s case. Qurate Retail, Inc. (NASDAQ:QRTEA) is the most popular stock in this table. On the other hand Shaw Communications Inc (NYSE:SJR) is the least popular one with only 14 bullish hedge fund positions. Reinsurance Group of America Inc (NYSE:RGA) is not the most popular stock in this group but hedge fund interest is still above average. This is a slightly positive signal but we’d rather spend our time researching stocks that hedge funds are piling on. Our calculations showed that top 15 most popular stocks among hedge funds returned 19.7% through March 15th and outperformed the S&P 500 ETF (SPY) by 6.6 percentage points. Unfortunately RGA wasn’t in this group. Hedge funds that bet on RGA were disappointed as the stock returned .4% and underperformed the market. If you are interested in investing in large cap stocks, you should check out the top 15 hedge fund stocks as 13 of these outperformed the market. Did Hedge Funds Drop The Ball On Kansas City Southern (KSU) ? Here’s What Hedge Funds Think About The Gap Inc. (GPS) Here is What Hedge Funds Think About Jack Henry & Associates, Inc. (JKHY... Here’s What Hedge Funds Think About IDEX Corporation (IEX) Were Hedge Funds Right About Souring On WestRock Company (WRK) ? Were Hedge Funds Right About Flocking Into Altice USA, Inc. (ATUS) ?